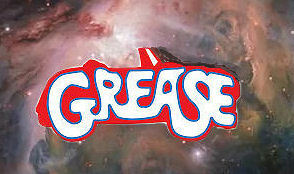 Material moving through interstellar space encounters this grease routinely, then. It will stick to surfaces. Over billions of years of such interactions, major accumulations of this type of gloop will build up on objects, like interstellar comets, and free-floating asteroids and planets. 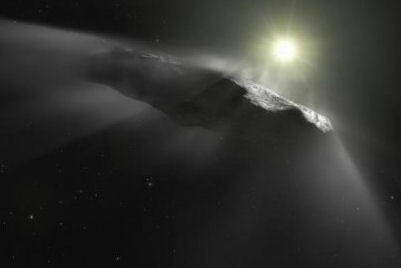 The first interstellar object to be directly observed moving through our solar system was 1I/'Oumuamua, a tumbling, shard-shaped object which was detected last autumn (2,3). 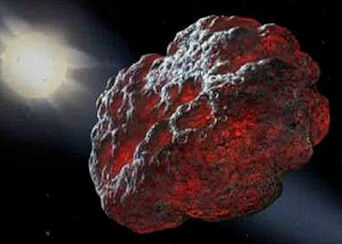 Such objects were expected to behave like comets, and outgas as they approach the Sun. However, this object did not spray the solar system with its internal gases, leading astronomers to conclude that this object had originally been an asteroid which had been ejected from another star system. However, recent observations and work on 1I/'Oumuamua's trajectory indicate that its motion is being affected by another factor beyond gravitational interactions - it is moving faster than it should (4). This is thought to be due to outgassing after all, leading to the conclusion that this object is an interstellar comet (5). "Until now there has been uncertainty over how much carbon is drifting between the stars. About half is expected to be found in its pure form. The rest is chemically bound with hydrogen in either a grease-like form, known as aliphatic carbon, or as a gaseous version of naphthalene, the main chemical component of mothballs. This space grease is surely an incredibly important component in planet-building, helping to explain why colliding materials don't simply blast away from each other at the kinds of speeds they are travelling relative to one another. Instead, they stick together. 3) The planet's formation in situ. All three of these scenarios require certain conditions for them to work, which means that no single formation theory stands out as particularly probable. The capture and scattering models depend upon the interjection of outside bodies (passing stars or brown dwarfs, or objects in the Sun's birth cluster). The in situ formation of a planet so far from the Sun implies that the Sun's protoplanetary disk was significantly larger than generally accepted. 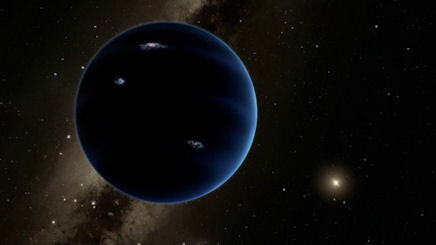 The formation of Planet Nine in its calculated position thus remains problematic, based upon standard models of planetary and solar system formation (e.g. the Nice model). Further, whatever processes which placed it in its proposed current position would have significantly affected the layout of the Kuiper belt within its overarching orbit. This factor is what the current investigation described by this paper aims to solve. This paper then describes computer simulations of the early Kuiper belt, and how the shape and extent of the fledgling belt may have affected the complex interplay between it, Planet Nine, and the objects in the extended scattered disk (1). The research team modelled two distinct scenarios for the early Kuiper belt, each of which matches one or more formation scenarios for Planet Nine. The first is a 'narrow' disk, similar to that observed: The Kuiper disk appears to be truncated around 50AU, with objects found beyond this zone likely having been scattered outwards by processes which remain contentious. The second scenario is a 'broad' disk, where objects in the Kuiper belt would have routinely populated the space between Neptune and the proposed orbit of Planet Nine, hundreds of astronomical units out. This would match a formation scenario involving an extensive protoplanetary disk. Once the theoretical Planet X object is in place, the computer simulations seek to discover whether the scattered outer solar system objects in its domain can stabilise in its presence. many of these objects are adversely affected by the presence of Planet Nine over time: their orbits 'librate' through numerous interactions. In the accompanying blog article to explain their paper, Khain provides helpful animations to explain these oscillating orbital behaviours, drawing an analogy with the wagging tail of a dog (2). Sometimes, the librations are quiet, natural fluctuations in the orbits. At other times, the librations destabilise and the oscillating object kicks off. The calculations showed that the broad early Kuiper belt generated a bimodal structure of scattered objects associated with Planet Nine - some aligned, some anti-aligned with its position in space (1). The average distances from the Sun for these scattered objects is considerably greater than normal KBOs - making it difficult to find them using current observational technologies. The researchers note that the averaged distances for the anti-aligned objects is similar in both Kuiper belt scenarios (the broader anti-aligned objects seem to be perturbed back down into the solar system, becoming centaurs). The real difference is seen in the aligned objects, whose distributions vary greatly with initial Kuiper belt conditions. The team also ran simulations with Planet Nine in the plane of the planets, and inclined to the ecliptic, finding little difference in their results. This is important because Planet Nine is thought to be highly inclined to the ecliptic. What I'm taking from this is that the aligned objects are no longer considered to be in an unstable situation. Potentially, then, Planet Nine could be oriented with this cluster in physical space. If so, then Planet Nine could be in the opposite side of the sky to that indicated by the Caltech team in 2016. In reviewing the clustering effects of the extended trans-Neptunian objects (ETNOs), there appears to be a shift in emphasis on whether the objects which are aligned or anti-aligned to Planet Nine are stable. I detect movement on this issue, which may have a significant impact upon the projected location of the planet itself. Regrettably, my questions to Mike Brown on this issue have gone unanswered. Ever since the first paper about Planet Nine was published, I have argued that their analysis about the planet's position is diametrically opposite to a previous body of evidence about the location of Planet X (3). I suggest that the aligned/anti-aligned bodies in the initial Planet Nine cluster are the wrong way around, and that this will become increasingly apparent as more of these scattered objects are discovered. If the broad early Kuiper belt scenario is correct, then there may be a substantial population of scattered objects awaiting discovery, whose average distances spread out significantly. The current cluster of ETNOs could be the tip of the proverbial iceberg. If this potential population is discovered as the ability to detect such distant objects improves, then it could have repercussions on our understanding of the Sun's birth environment within an early stellar cluster. This paper provides such a theoretical model, assuming, of course, the presence of Planet Nine. An Alternative Explanation for the ETNOs? There are a growing number of objects in the outer solar system which defy explanation. These objects are located further out than the objects in the Kuiper Belt and, unlike these inner cousins, they are not 'shepherded' by the planet Neptune. This semi-detached set of objects forms the extended scattered disk. Sedna is an example, whose far flung orbit was discovered back in 2002. In recent times, patterns have emerged among some of these objects which suggests an explanation for this eccentric behaviour: They appear to have been perturbed into these weird orbits by the action of a missing planet located same way beyond them. They provide evidence, many astronomers suggest, for the existence of Planet X, or, as it is now referred to in academic circles, Planet Nine. But not everyone agrees, and other explanations have been offered to explain this strange orbits. High on the list are the action of passing stars during the lifetime of the solar system. Again, such an explanation relies upon the temporary incursion of a massive objects, which draws out some of the Kuiper Belt objects. Another possibility is that the objects in the extended scattered disk (ETNOs) originated within the comet clouds - more specifically, the inner Oort cloud, of Hills cloud. They may be transitioning comets which will eventually become Halley-like comets closer in to the Sun. A new explanation, offered by scientists working at Boulder, Colorado is that these objects aren't really so weird after all. They have set up some computer simulations which suggest that they orbital paths may become more eccentric and extended simply as a result of gravitational interactions from within the Kuiper Belt itself (1). If true, then there is no need to seek out Planet Nine (which is proving evasive, despite the near certainty with which it is being claimed). Although a series of small-scale perturbations may provide a model to explain anomalies, such an explanation does not seem to offer an explanation for the patterning of the ETNOs, however. One would expect such a series of small-scale events to randomise the effect. It may also not explain the highly inclined nature of some of these objects (2). I suspect Mike Brown et al. will shortly respond and point out their analysis of the common 'argument of perihelion' of these objects. This is a technical issue, but an important one. A series of small-scale adjustments over time would randomise the effect, and not create such a definitive clustering. The ancient religious beliefs of the Sumerians are making a comeback - in Iceland. Zuism, defined as Sumerian-Mesopotamian Neo-paganism, draws upon the world's oldest myths and pantheon of gods - the epic tales of Anu, Enlil and Enki (1). It became registered as a religion in Iceland in 2013. Much of the drive to promote this quietly resurgent religion appears to derive from tax laws in Iceland: The numbers being crunched on Zuist accountants' clay tablets seem to offer a loop-hole for devotees wishing to sidestep parish fees (2). As the objectives set out by the organisation seemed to be political, rather than spiritual, Icelandic Zuists have begun to put some flash on the old Mesopotamian bones, to avoid charges that Zuism isn't really a religion at all. Now, Iceland's neo-pagan movement hopes to build a ziggurat-inspired temple, and have sought planning permission from Reykjavik City Council. 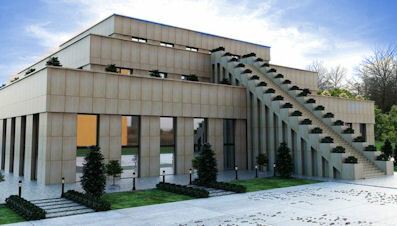 Simply called 'The Ziggurat', it will offer its members ceremonies like weddings, name-giving and their ever-popular beer-and-prayer meetings (3). I'm all for the reappearance of ziggurats. A lot of the rites of ancient religions are still 'followed' within secret societies, although many of their members probably don't realise it. Various orders of Freemasons, for instance, amalgamate Egyptian symbols, alchemy and initiation mysteries into an ostensibly Judaic monotheism. This 'gnostic' approach was very popular during the Graeco-Roman period, when the expanding Roman Empire sought to consolidate its new domains through recognition, and assimilation of local religious sects. That thinking was extended into the Christian era. But the understanding is that paganism be kept very much under heel in this way - tolerated to keep the masses happy. Some years ago, when people were asked in the UK Census about what religion they were, many atheists put down 'Jedi', and this took off for a while. Regrettably, moves to make this a more formal arrangement have since been blocked (4). This rearguard action to prevent the growth of Jediism didn't stopped Scientology, though (5). Arguably, anything that is 'old' pagan religion is blocked through fear of a return of the old ways (Witchcraft being a prime example). Scraps remain within our culture - Morris men, May poles, Hallowe'en and, perhaps surprisingly, Christmas. On that basis, a religion from 'a long time ago in a galaxy far, far away' would have scored highly on the Establishment's hit-list. The same applies to Sumerian neo-paganism, which is not likely to make a big impression in the UK any time soon. Make up a whole new fictional sci-fi religion, though, and you get a big thumbs-up. Weird. The late Zecharia Sitchin might have pointed out that the Sumerian religion was less of a spiritual discipline, and more of a history lesson. Polytheism emerged from tales of the gods, who were 'flesh-and-blood' colonists from another world (6). Perhaps this applies, in a derivative way, to the old European pagan religions, too. In Iceland, the heathen Norse religion is also making something of a comeback, under the snappy name Ásatrúarfélagið.